You are here: Home / Recipes / Crock Pot Recipes / Slow Cooker Applesauce! 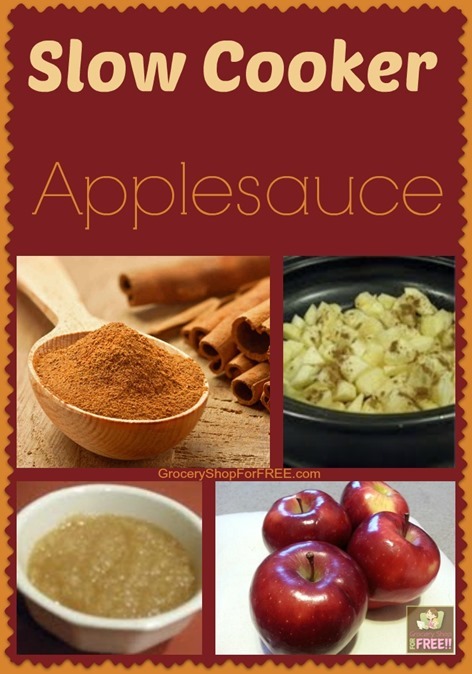 My friend Sarah from Give Me Neither, shares her Slow Cooker Applesauce Recipe with us! I have applesauce in the slow cooker right now and it smells wonderful. I love fall. This applesauce is amazing! It packs a punch! You may prefer it sweeter, but this is perfection for us. This is not an exact science, but here’s what I did. All you need is apples, apple juice, and cinnamon. Wash 15-20 medium sized apples. Peeled, cored, and cut into chunks. Put them in the slow cooker. Add 3/4 cups 100% apple juice. Turned the slow cooker on high and put on the cover. I checked it about 2-2.5 hours later, gave it a stir, and turned it down to low for about 30 minutes longer. Your cook time will vary depending on the type of apples and how chunky you like your applesauce. You may need more or less apple juice depending on the apple variety too. I used Empire apples. At Give Me Neither, Sarah finds joy in discovering and passing along the best deals, showing that there’s a place for quality even on a budget. She is a wife and mom to 2 little boys moving toward a green, healthier way of life, waiting to bring home a child from South Africa, and learning what it means to live richly even without being “rich”.